To fix the gloss issue, I decided to try out Lifecolor Gloss Clear instead. I thinned it with water (by guesstimate) and went ahead to spray 2-3 layers. It’s really a lot easier to use than Future. So much so that I’m considering just using Future for other things instead of glossing. So anyway then it was time for panel washing again. And this time there weren’t any major issues at all. Then I noticed that I have lost the port vent for the inlet. Crap. 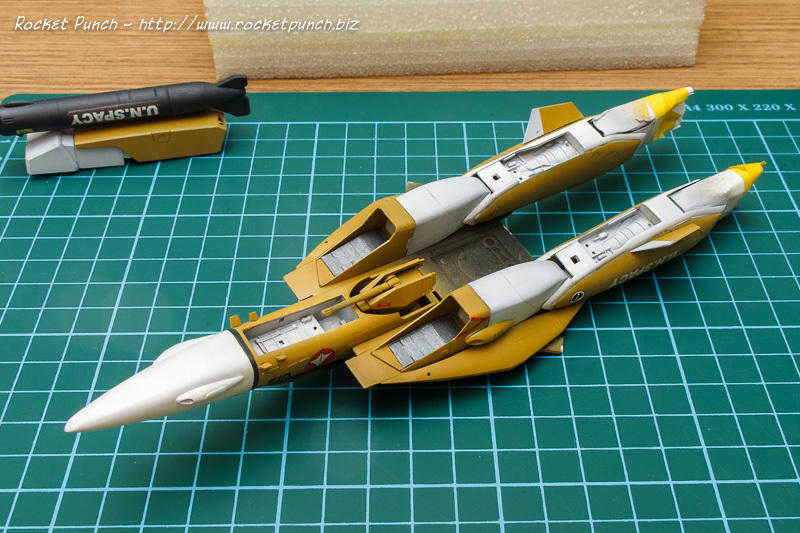 Luckily for me I have a spare that I found recently from an abandoned VF-1S project. So I quickly painted it up with Gunmetal Gray and attached with superglue. The MLG and nosegear were then attached along with their doors with superglue. 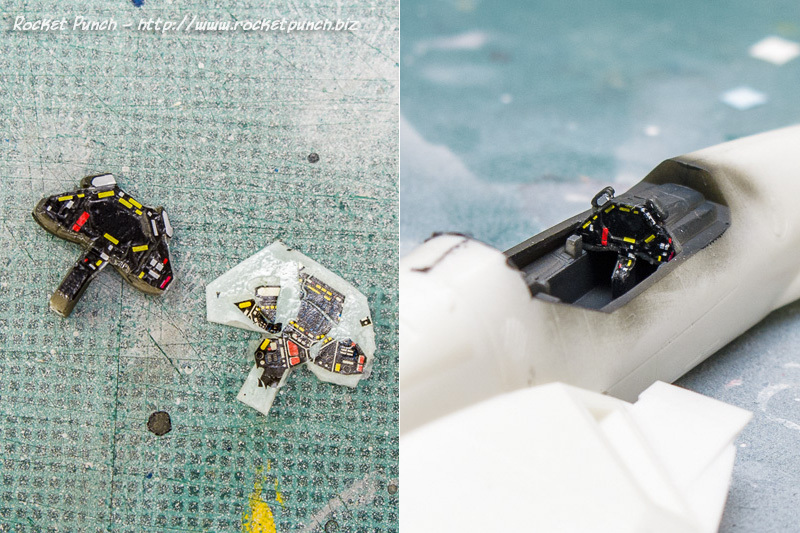 I then carefully attached all the clear parts onto the kit with cement. Having coated them with Future they didn’t fog at all. 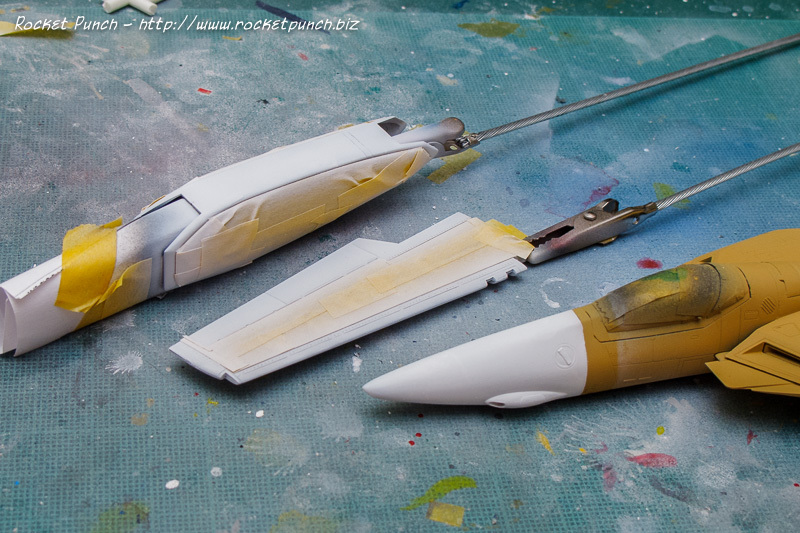 I also handpainted Transparent Red and Blue on the tip of the tailfins at this point. I then gave everything a few thin coats of Vallejo Polyurethane Satin Gloss to seal everything up. I managed to turn the clear parts semi-gloss which I went back with a swipe of Future to shine them back up again. 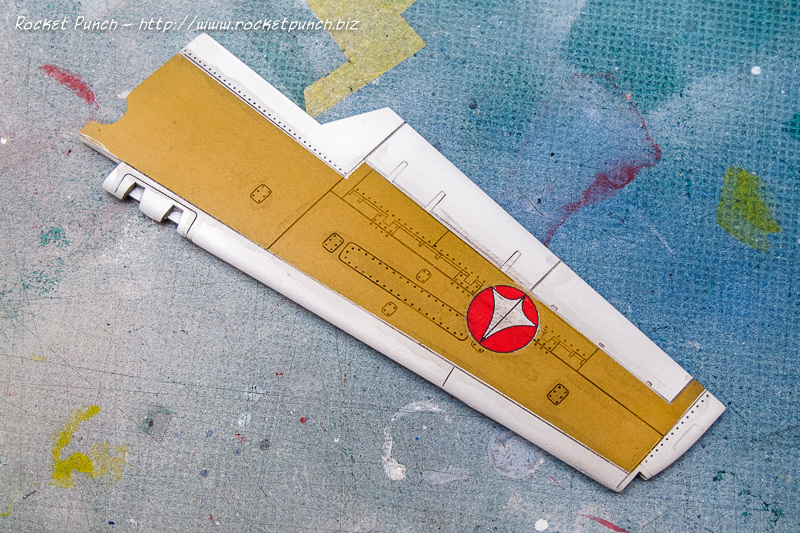 Lastly was the moment of truth which was to remove the masking tape over the canopy. And lucky for me it turned out very well apart from the port side where I overmasked and there was some missing ‘frame’. I carefully handpainted with Black Gray to fix it. Right before I finished the port MLG wheel broke off with the male part of the joint attached. 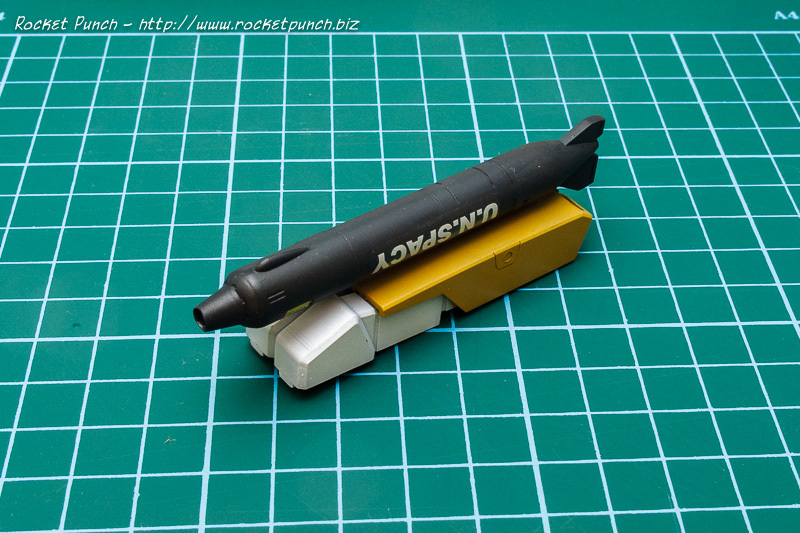 I used superglue and ran some Tamiya thin cement on the joint hoping it will hold together. The wings were then attached without cement and then placed in the swept position and I’m happy to say this project is finished! 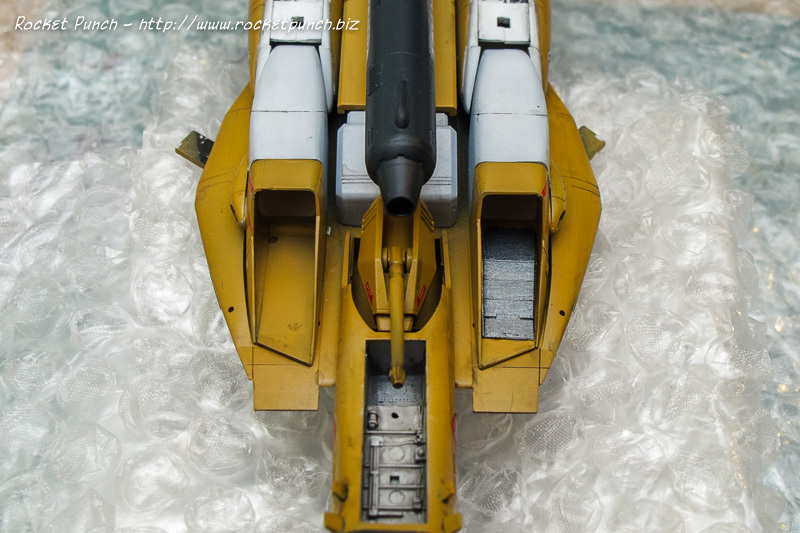 I decided to assemble the major assemblies together before doing the panel line wash, so first up, the gun was clamped in between the two part bottom fuselage. Then the head assembly was cemented into position. 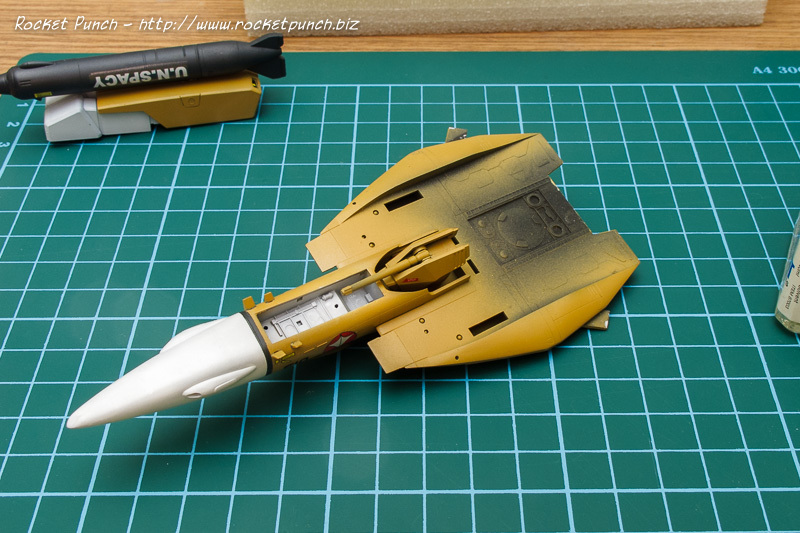 Next the engines and intakes are glued in place. 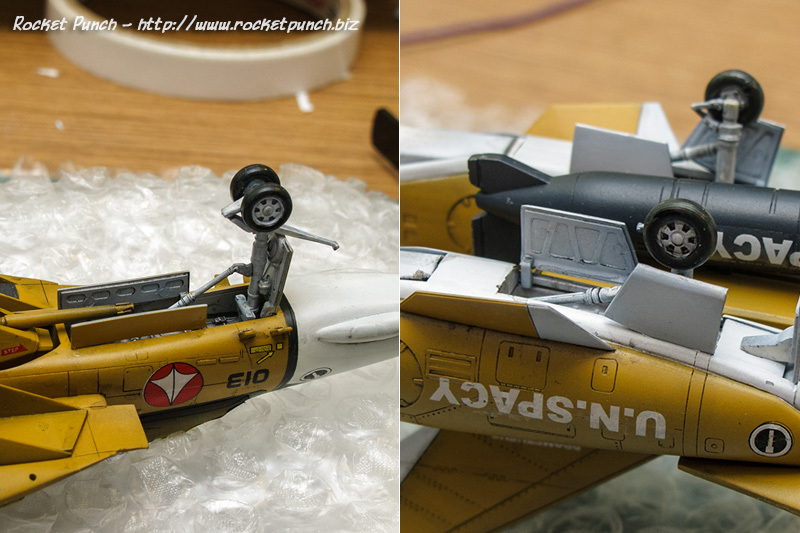 The gun and bottom fuselage are then attached and I’m primarily done. 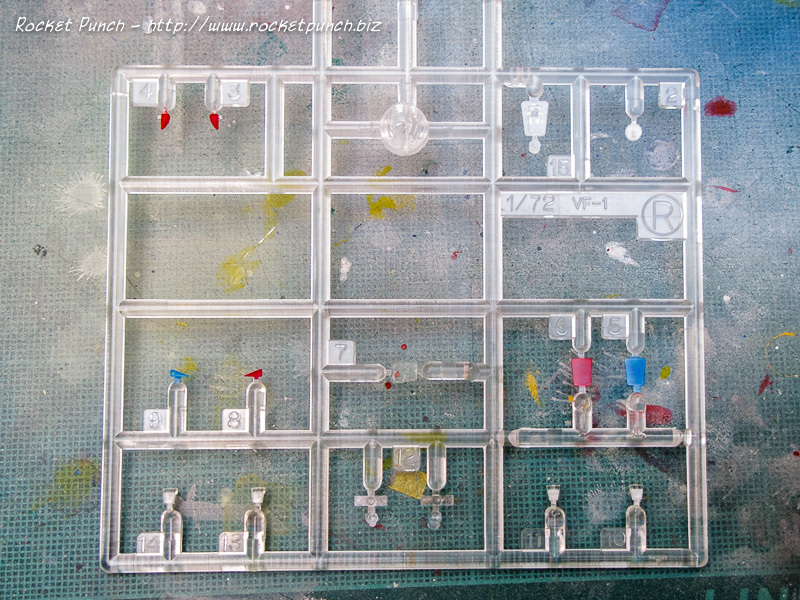 The rest would be panel washed separately before a final assembling together. 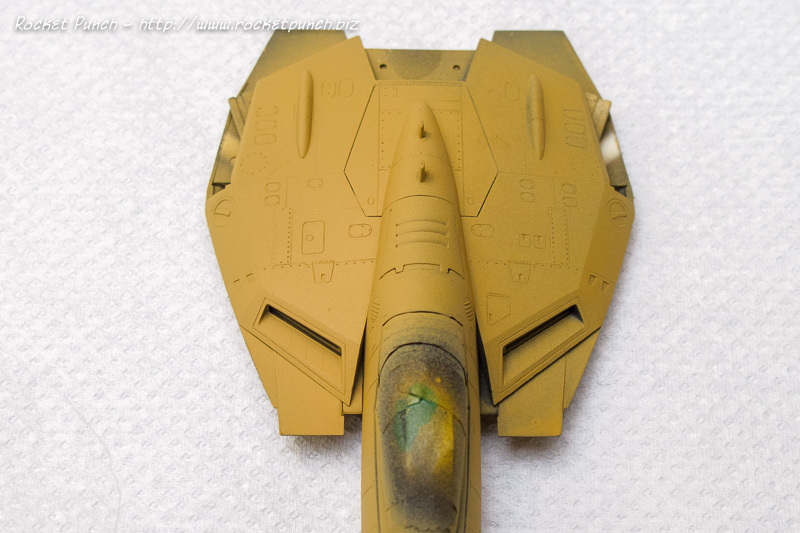 So I first did a wash on the port wing with Vallejo Model Wash Black Gray and it turns out that the Future coat I did was not thick enough and I had to really go in and scrub the wash to get rid of it. And even after doing that, there are still stains all around the wing. 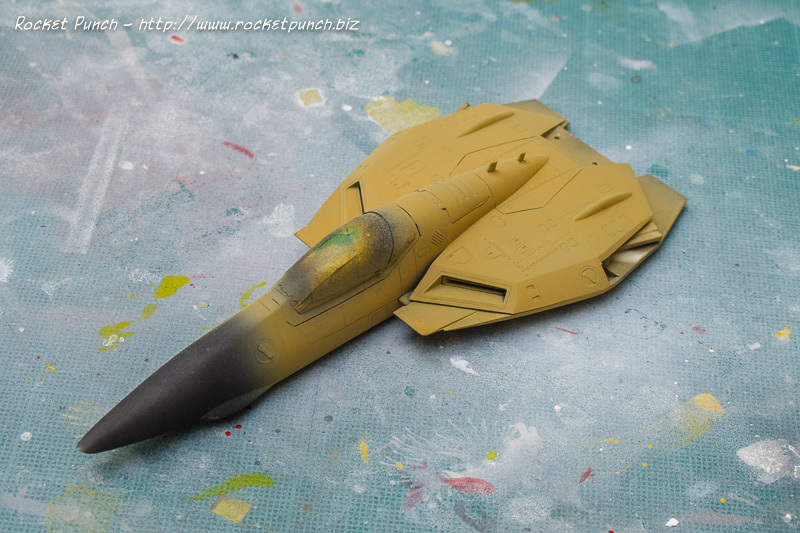 I’ll need to do another gloss coat over the whole kit to get it smoother. So the kit is now shelved for another round of gloss coating. In the meantime, I panel washed the landing gear with no issue with Vallejo Model Wash Gray which gave them some subtle depth. I then painted the clear bits Transparent Red or Blue and brushpainted Future over them to prepare for final installation. So, a delay then. But luckily not too much of one. Detail work begins with the anti glare panel and a black band that surrounds the nose. 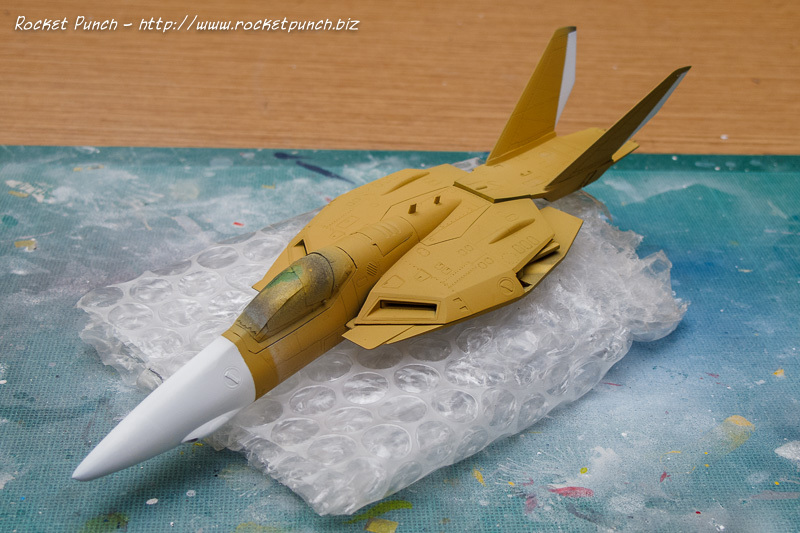 The Hasegawa decal is a multipart affair the Samueldecal sheet doesn’t even include one so I have to mask and spray it. 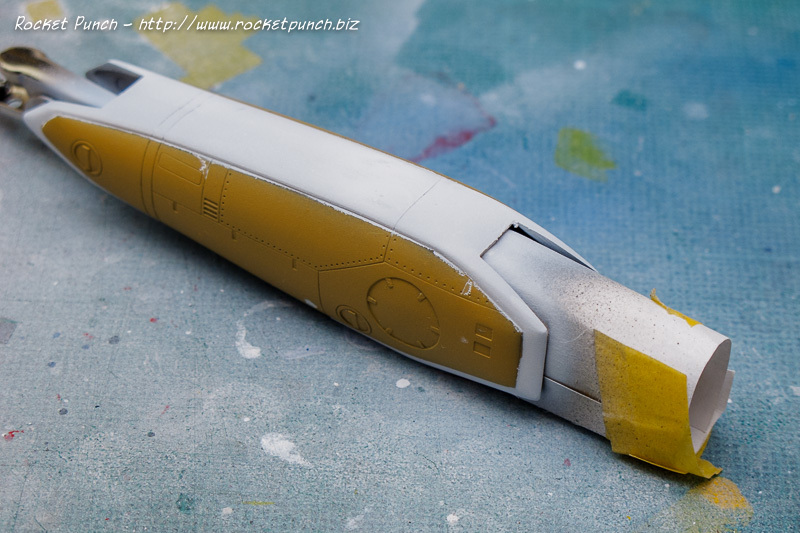 I also took the opportunity to paint the inlets on the fuselage. It was also at this point when I realized the canopy frame needed to be black also. Note to self: always look at references. As you can see, the work isn’t very done very cleanly. So I ended up redoing most of it. After a layer of Future, decaling begins. 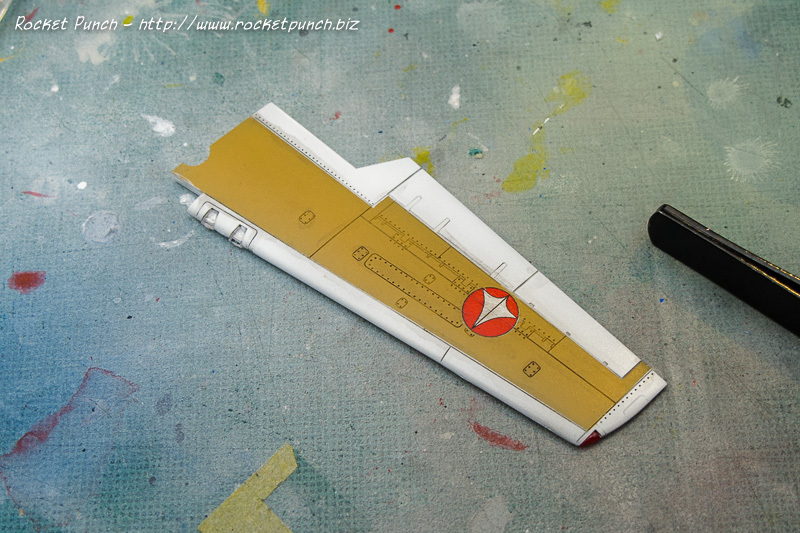 The Samueldecal require me to cut as close as possible to the markings to reduce the amount of extra decal film. 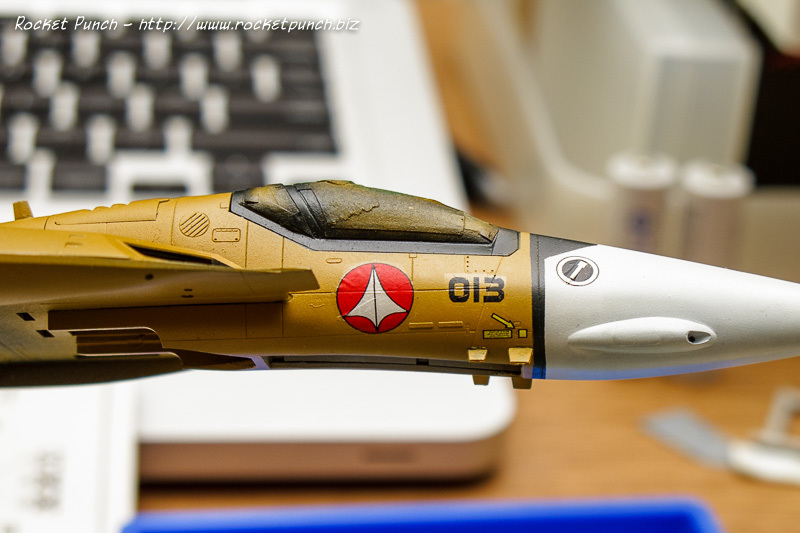 The red Macross logo also came with a white roundel so I had to stack the colored decal over it to make sure the white colored sections are opaque. I then carefully cut the decals wherever they cover panel lines with a sharp knife so when I do the panel line wash it will still flow down the panel line. The decals are robust and thin but the markings themselves ‘chip’ off quite easily as can be seen on the photo below. Otherwise though, they are surprisingly easy to use and they snuggle down very well with some Mark Softer. 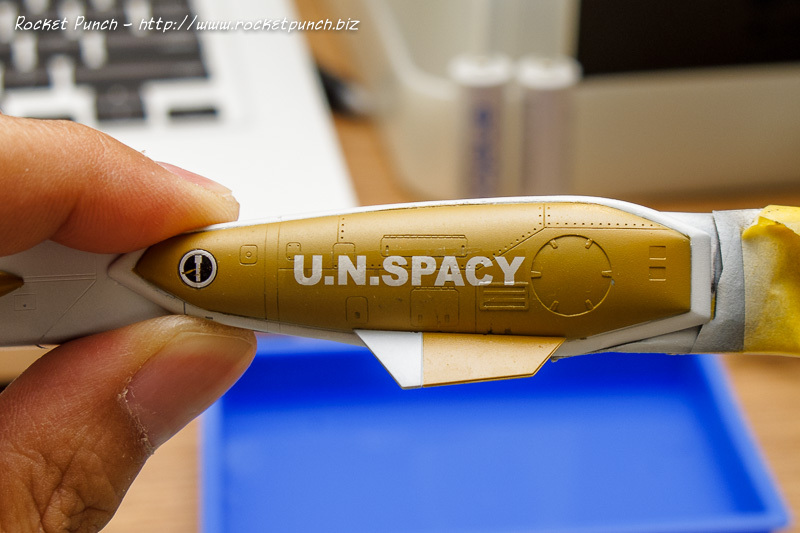 In the photos the decals still look wrinkly which should cure smooth. Once they are all cured I will do touch-ups with paint. Since I can’t leave it well enough alone, I decided that I needed to fix the brown color. 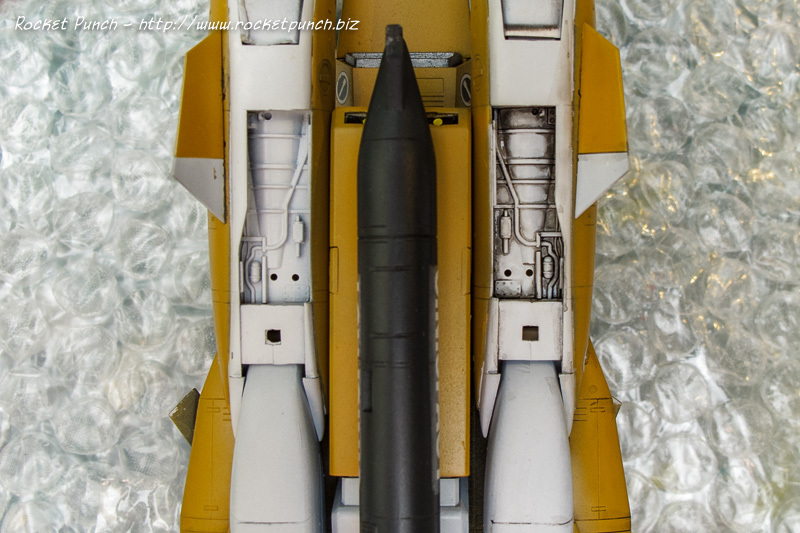 The new color (on the left below) is Model Color 977 Desert Yellow. Much better. The second main color is white and I realized that I’d forgotten how hard it is to get a very ‘white’ color especially over a dark color. Even after a few passes, it still looks like a light gray. So besides having to do a ton of masking, I also had to do multiple passes of white over multiple sessions. 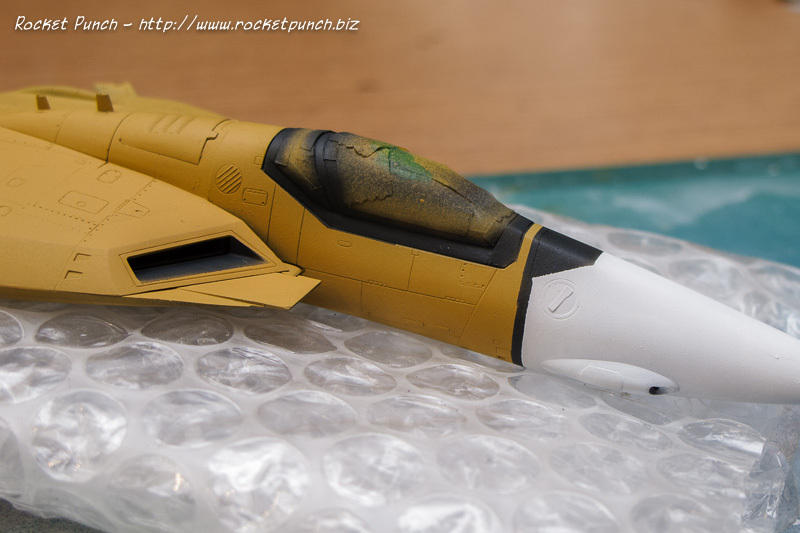 And of course due to my laziness, there is overspray. Yay! Touch-ups! 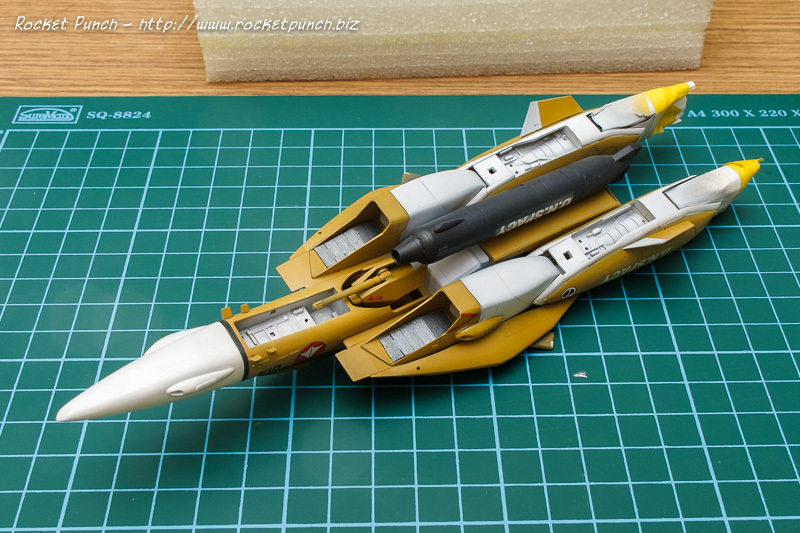 I need to do quite a bit of touch-ups, but the VF-1A is finally taking shape! My kit is very old. I got it when it was first released in 2000 in fact. 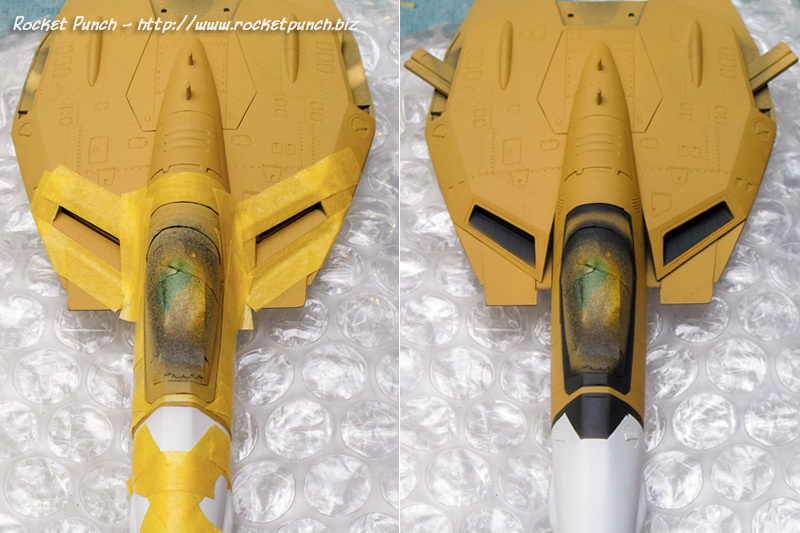 Consequently, the decal sheet has gone very brittle and yellow. I ended up replacing my decals with a set from Samueldecal, which are ALPS printed. 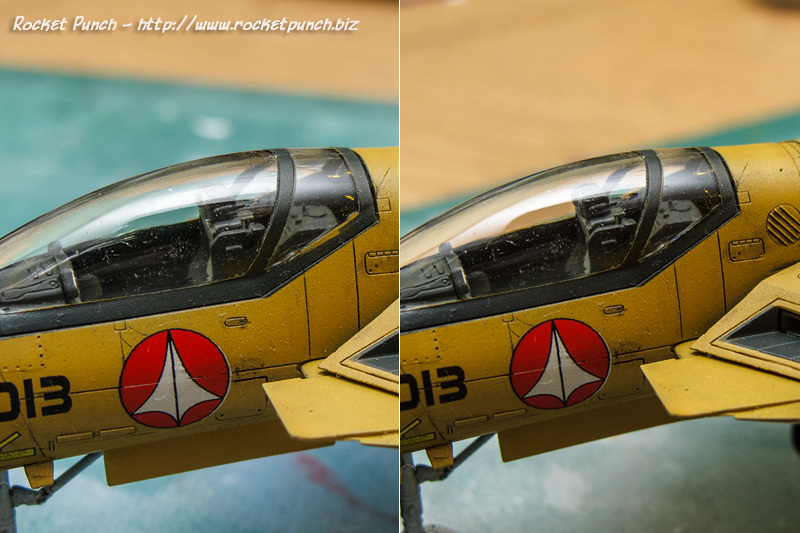 The Samueldecal decal is very soft compared to Hasegawa’s but it works fine. 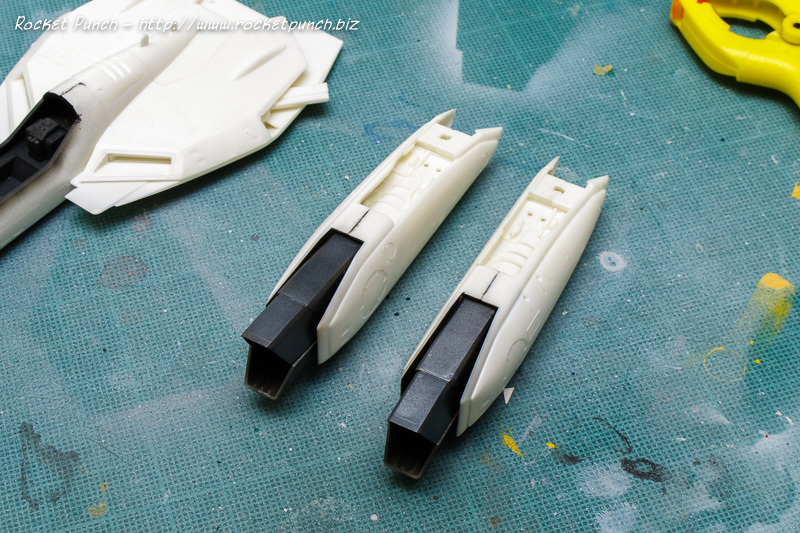 The way the kit is designed, I’m required to prep and paint the exhausts before enclosing them with the 2 halves of the engine bay. These were given a base color of flat black-gray with Black Metal from the Vallejo Model Air Metal line. Painting then begins. 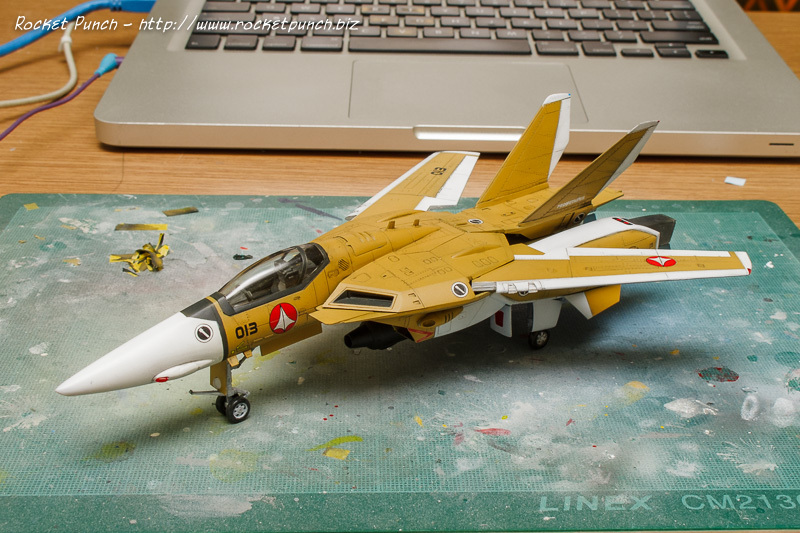 I’ve decided to depict this VF-1A as a unit from the TV series, hence it’s mostly brown and white. 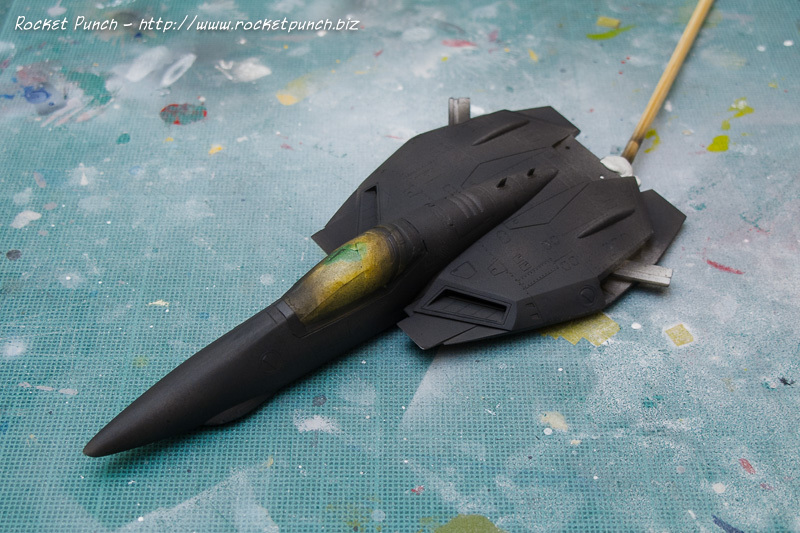 I also decided to try a new method of painting using black color as a primer base instead of gray or white. The primer I used is the A&K Interactive Black Surface Primer thinned slightly with Windex. Coverage was good but I find the surface is rougher compared to Vallejo Urethane Primer. Both do spray easily which is great. For the brown color, I went with Lifecolor UA097 Middle Stone. Based on what’s seen onscreen, the shade is definitely not accurate. But it’ll do. 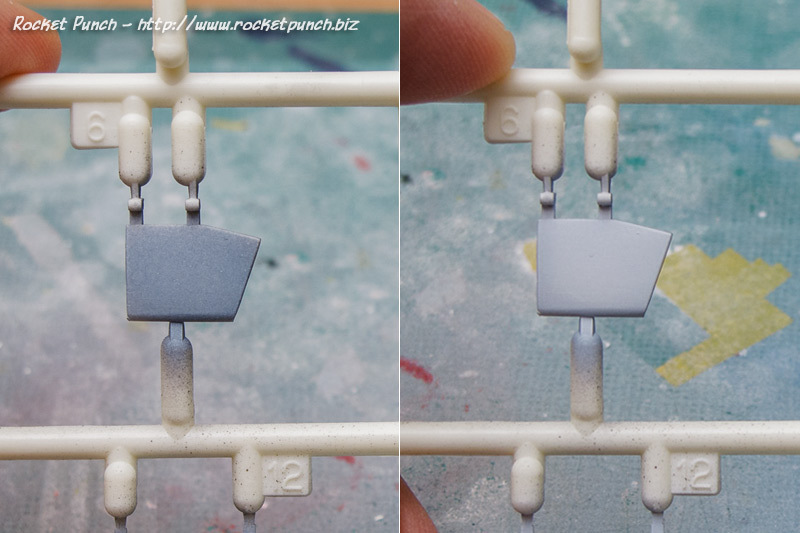 I like how the black base primer acts subtly as a preshade for the main color and if I controlled my airbruch better, I’d probably be able to pull off a more obvious preshade look.